Meat - Italian Restaurant Takeaway Lanzarote There are 14 products to choose from. Takeaway Lanzarote - Restaurants Playa Blanca Beef fillet with balsamic vinegar. Takeaway Lanzarote - Restaurants Playa Blanca Green pepper beef fillet. Takeaway Lanzarote - Restaurants Playa Blanca Beef fillet with mushrooms sauce. Takeaway Lanzarote - Restaurants Playa Blanca Grilled beef fillet. Takeaway Lanzarote - Restaurants Playa Blanca Entrecote con rucola y grana. 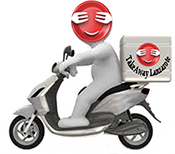 Takeaway Lanzarote - Restaurants Playa Blanca Green pepper entrecote. Takeaway Lanzarote - Restaurants Playa Blanca Entrecote with mushrooms sauce. Takeaway Lanzarote - Restaurants Playa Blanca Grilled entrecote. Takeaway Lanzarote - Restaurants Playa Blanca Chicken with mushrooms sauce. Takeaway Lanzarote - Restaurants Playa Blanca Grilled chicken. Takeaway Lanzarote - Restaurants Playa Blanca Grilled lamb ribs.